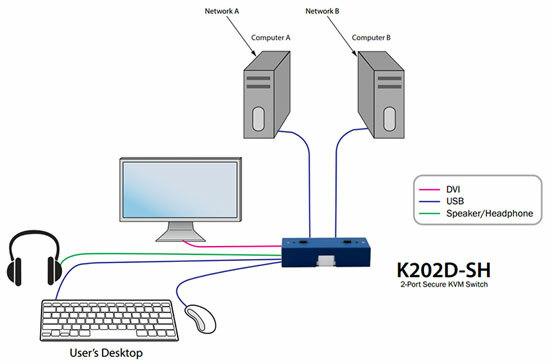 The K202D secure KVM switch features the most protections and separations between connected computers available on the market. This KVM switch eliminates points of vulnerability that have plagued other KVM units. With two connected computers, the K202D offers impressive levels of communications, even when connecting computers that are on different levels of security clearance and Internet access. K202D utilizes unidirectional optical data-diodes which insulates all connections from any possible points of data leakage among peripherals. Every K202D secure KVM switch is rigorously and extensively tested to ensure it will remain stalwart against any known form of KVM security attacks. The unit has been certified to meet EAL 4+ standards to assure it provides the highest level of security possible. This KVM can also be used to securely filter and lock USB ports preventing data export/import through mass-storage devices by hardware.